Allied Bank Credit Card Promo ~ Philippine Freebies, Promos, Contests and MORE! UPDATE 2 (2/2/2012): I have posted an incorrect UPDATE information below. It seems that this promotion has not been extended. I sincerely apologize for any inconvenience this has caused to Allied Bank, merchants of this promotion and credit card holders who were trying to redeem. UPDATE: Promo extended from September 1 to November 30, 2011. Redemption period on new promo is from September 1, 2011 to January 31, 2012. 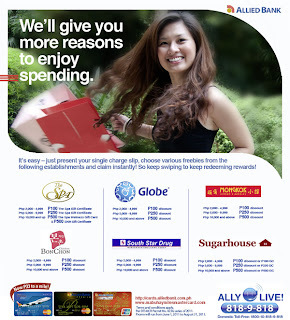 Allied Bank and PNB once again gives you more reasons to enjoy your spending. For a single receipt spent of not less than P2,000, P5,000 and P10,000, you can enjoy freebies and deals from The Spa, Globe, Sugarhouse, Bon Chon and other partner merchants. Cardholders may redeem one (1) freebie per charge slip and can make up to three (3) redemptions per store in a day. Simply present your single charge slip, choose various freebies from partner establishments and claim your freebies/discounts instantly. Given Allied Bank give you the best point-to-mile conversion at only P33, I'm noticing more and more people are using Allied bank including girl-kuripot.